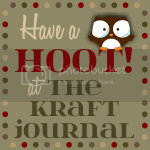 Welcome to Make It Monday with Kraft Outlet. Use this week's "La-La-Luv You", theme to inspire you to create your project and then link it up at the bottom of this post before 6:00 p.m. (Eastern Time) on Sunday February 12, 2012. All of our followers who participant in our challenges for the month of February have a chance to be featured on our "Feature Me Fridays" posts as well as be entered to win a $15.00 Kraft Outlet Store Voucher! The more challenges you enter this month, the more chances you have to win! 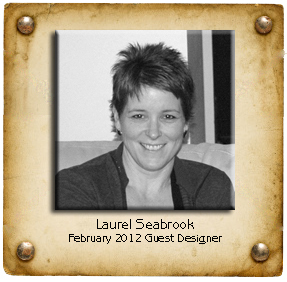 We're very excited to have Laurel with us as our Guest Designer during the remainder of the challenges in February and she told us that she's excited too! 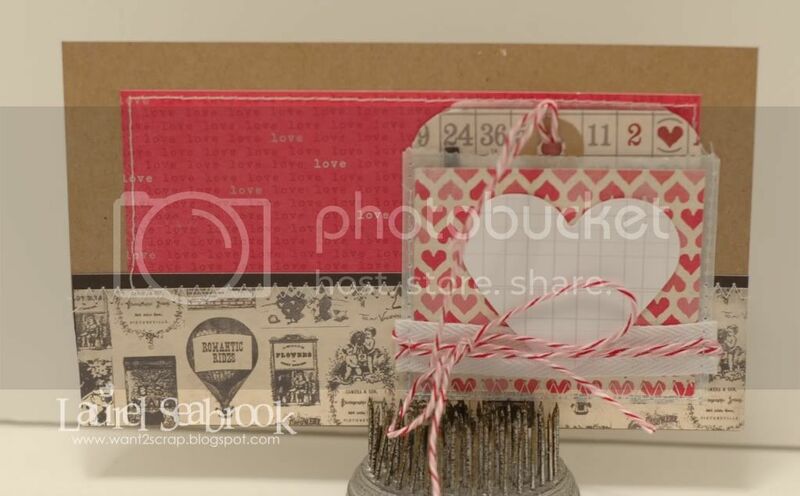 To create her card for this week's challenge, Laurel started with a base of the Lunch Bag Kraft Cardstock and then layered on some pattern paper. She also cut down a Glassine bag to form a small pocket, covered it with coordinating pattern paper and wrapped it with a bit of Twill Tying Tape before stitching it to the card base. Next, she made a little tag out from more patterned paper, punched a hole in the top and placed a Round Hole Reinforcement Kraft Labels at the top of the tag, rounded the corners and added some letter stickers and twine. To learn more about Laurel and her other great projects visit her blog. Debbie Carriere created this card with layers of Lunch Bag Kraft Cardstock, Buff Ivory Cardstock, and patterned paper on a black cardstock base. 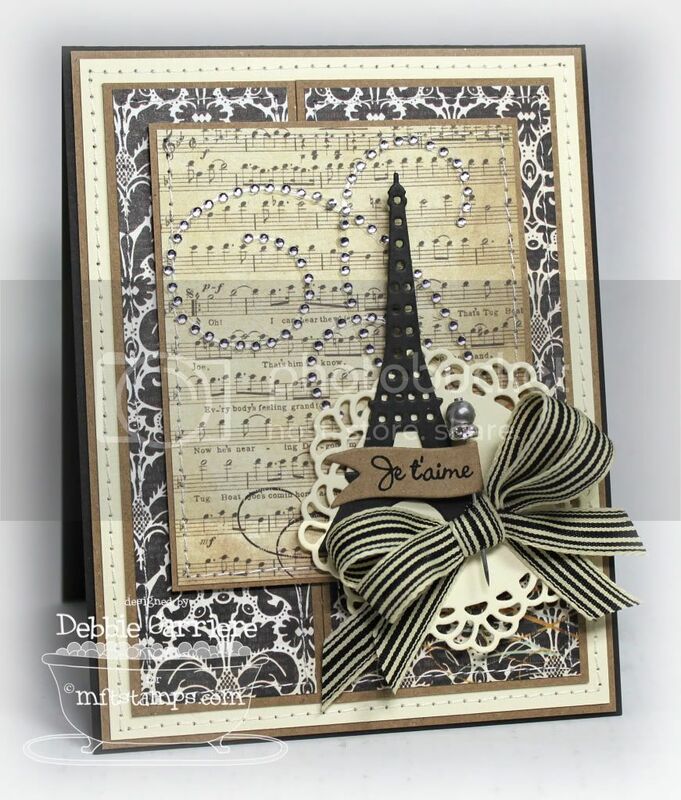 Her focal image is an Eiffel Tower die-cut accented with a sparkle flourish. The sentiment flag was glued to a Pewter Stick Pin and stuck in a double twill bow adhered to the base of the Eiffel Tower all on top of a small doily die cut from Buff Ivory Cardstock. 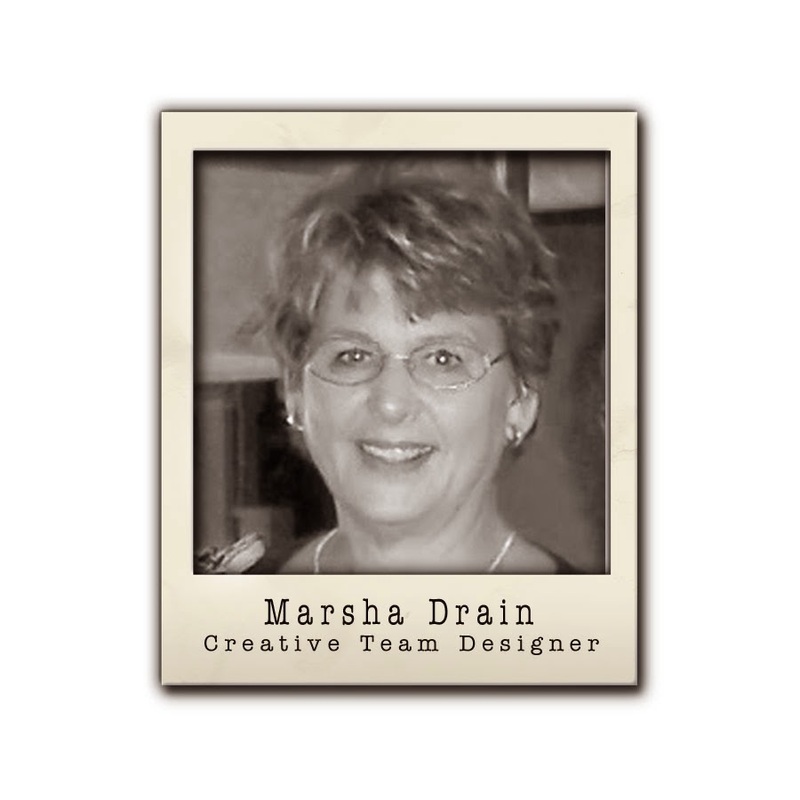 For more details, visit Debbie at her blog. 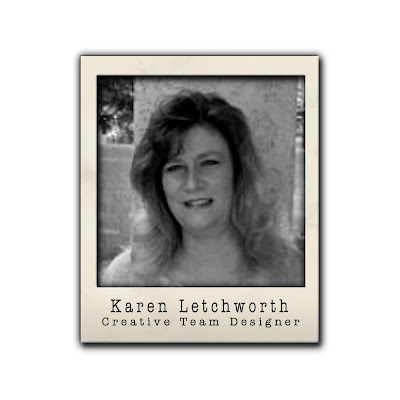 For today's La-La Luv You card, Debbie began with a base of Buff Ivory Cardstock. Layered on top of that is a piece of Brown Kraft Cardstock which Deb inked with cream paint to create a time-worn look. On top of these two layers, Debbie adhered some pretty patterned papers and sewed around all the edges with a machine zig-zag stitch to create a patchwork effect. 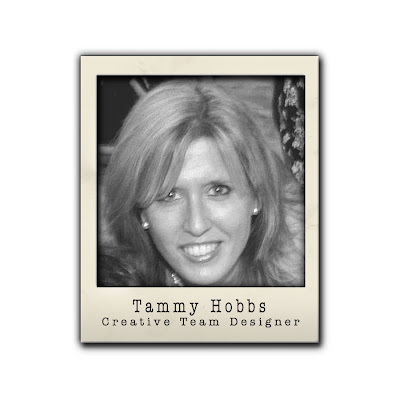 Next Debbie created a sweet little banner using die cuts from Buff Ivory Cardstock and patterned paper. Chipboard alphas were glittered and attached to the banner. 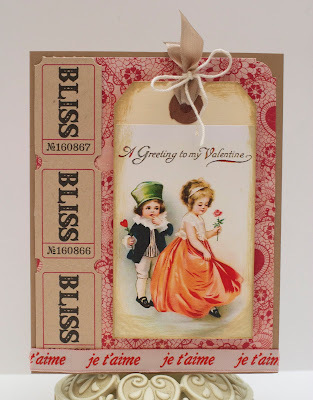 Lastly, Debbie die cut a tiny envelope from Brown Kraft Cardstock, inked the entire front, stamped a couple vintage images with Kraft ink and added pearls, lace, a button and Green Baker's Twine. 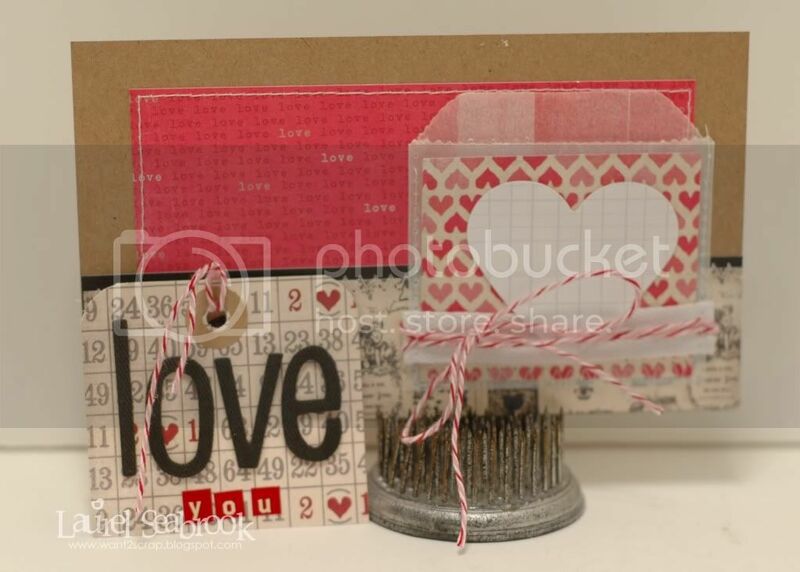 Jennifer thought this little Valentine for her husband fit the "La-La-Luv You" theme of the week! 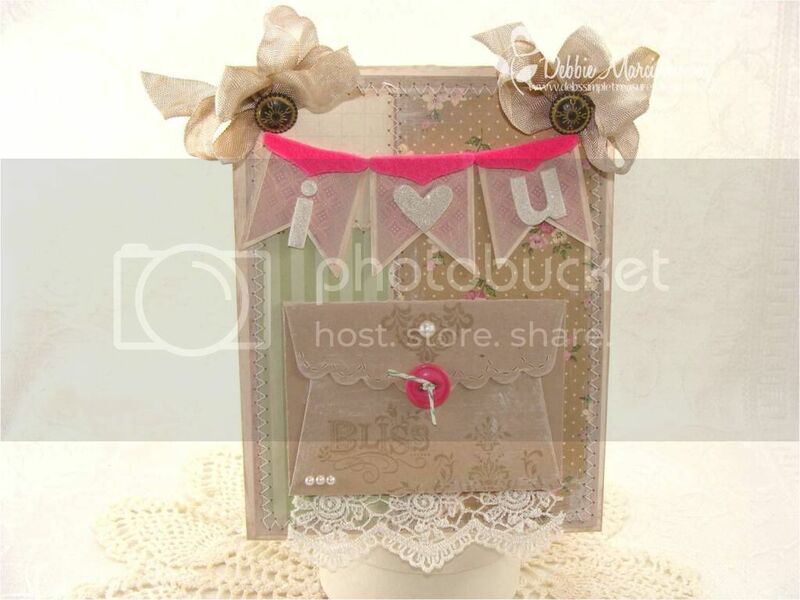 She made the card of a base of brown kraft cardstock, and layered some tickets and some ribbon on the edges. The vintage Valentine image was mounted on a shipping tag and tied with some seam binding and some hemp cord. Head over to her blog for a detailed supply list! wow, such stunning work! Thanks for the fun challenge! Great inspirations. Thanks for the chance to try out. Im a new follower. Nice cards from the DT Members, thanks for sharring.